My Talking Tom 2 is the highly anticipated sequel to the popular talking pet app, My Talking Tom. 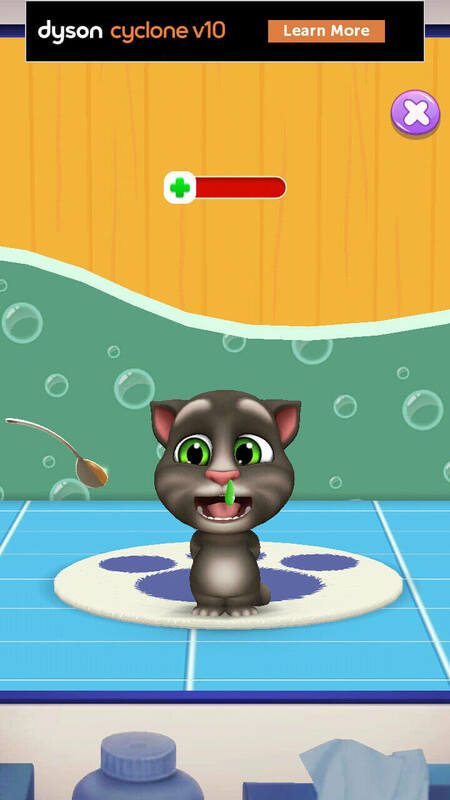 Developed by Outfit7, a studio that’s renowned for creating talking pet apps that delight kids and adults alike, this sequel lets you take care of your own virtual pet kitten. You’ll need to feed it, bathe it, play with it and so on. There tons of mini-games for you to play, locations to visit, and cards to collect as well. My Talking Tom 2 is pretty similar to the original game in many ways. You’ll need to take good care of your virtual talking pet by making sure its needs are met, be it food, hygiene, happiness, and sleep. If any of its needs is too low, you may be barred from doing anything else. When it comes to variety, My Talking Tom 2 has plenty. There’s a wide range of food items you can feed your pet with… some of them may even cause your pet to breathe fire. Even the medicine cabinet is filled with a selection of medicines that will let you treat any of your pet’s ailments. 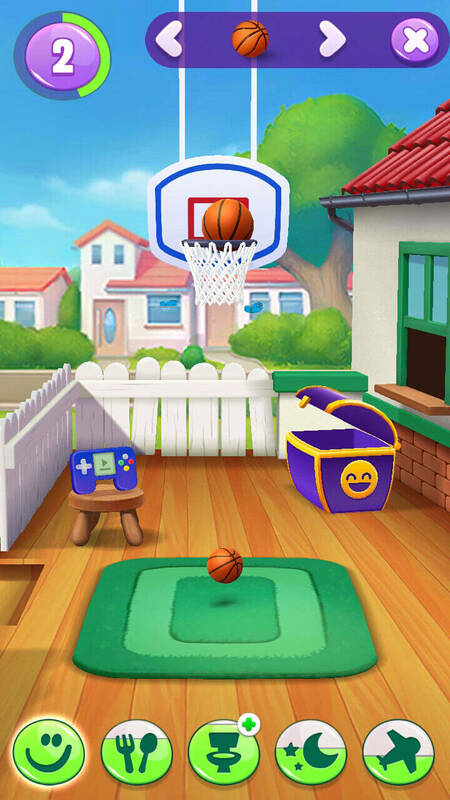 However, the feature that many players would probably gravitate towards in My Talking Tom 2 is the games. In your pet’s playroom, you’ll see 2 options – video games and a chest filled with toys. The video game option mainly consists of a myriad of hyper-casual games developed by Outfit7, such as the numbered brick-buster, Ice Smash; a space-themed Worm.io game, Space Trails; and connect game, Pet Connect. There are actually even more games for you to play but you’ll have to download the app separately. The toy chest, on the other hand, contains a selection of toys that both you and your pet can play. There’s the trampoline, the mini-basketball hoop, the punching bag and more. Unlike the video games, these toys can help increase your pet’s happiness but not earn you Plane Tokens. You’ll want to accumulate as many tokens as you can since it’ll allow your pet to travel to vacation islands where you can grab a reward chest. Reward chests will, in turn, give you some coins, some Stars, and a collectible card which you can then use to customize either your pet or your pet’s home. Unfortunately, you can get duplicate cards in this game, and although they do compensate the duplicate by giving you some stars in return, it would have been great to not get a duplicate card in the first place. Funnily enough, your pet cat will also have a “pet” of its own. This companion can be interacted with, though there’s a very limited number of actions you can do with it… unlike with your virtual pet, that is. Your starter companion, a mouse of some sort, can also be switched as long as you’ve got enough Stars. As a freemium game, My Talking Tom 2 has ads. However, the ads are not as many or as frequent as some other games… I’m looking at you Ketchapp games! As a talking pet app, your pet will mimic everything you say into your phone’s microphone. Most of the time, it gets it right, but you’ll really have to enunciate every word you say. Also, it works best in a quiet environment because sometimes, if the background chatter is loud enough, your pet will start copying everything said in the background. My Talking Tom 2 is, without a doubt, the sort of sequel that will make its “parent app” proud. The talking app series has gone far since its conception and there’s just so many fun things for you and your pet to do, aside from taking care of your virtual pet’s needs of course. 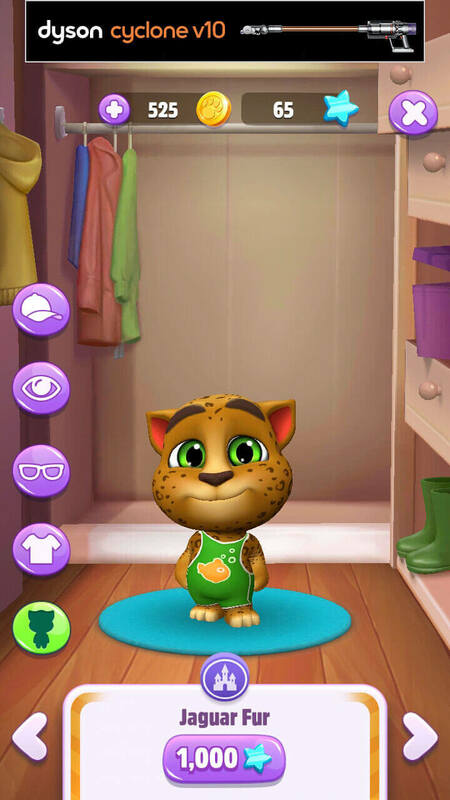 If you enjoy having a virtual pet in your phone, then this is the game for you.